...not at the same time, of course. Jonathan was working on a project at home today, so we were able to have both lunch and dinner together. 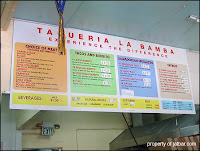 For lunch, we decided to have Mexican, and after both researching a bit, we landed on the same choice: Taqueria La Bamba. There are two in Mountain View, an original and a second one downtown. We chose to try out the original, and enjoyed it. Although parking was a bit rough (1:30pm on a Friday), service was very fast. I ordered a chicken burrito, Jonathan had the quesadilla suiza. The burrito included rice, shredded chicken, sour cream, cilantro, guacamole, and cheese (I opted for no beans). The tortilla itself was rather thick, but other than that it was pretty good. Jonathan's quesadilla was cheesy with plenty of steak, he said he'd definitely get it again. There were also a few other things on the menu we're dying to try (carnitas and pupusas). We'd been talking about getting pho on and off since we've been in California, and tonight was the night. We were able to stroll downtown and chose the second pho place we saw, Pho Hoa. I t is part of a very large chain, and has had numerous awards for its healthy menu. I went with the chicken (like I always do) and Jonathan ordered the steak and meatball. We also had two summer rolls, a personal favorite. For those who may be unfamiliar with Vietnamese cuisine, I'll explain a little. Pho is a soup, and while the ingredients vary slightly from one restaurant to another, most serve it very similarly. The broth is either chicken-based or beef-based (from what we've experienced), and includes noodles and green onions, along with the meat of your choice. It is served in a very large bowl, accompanied by a selection of sauces and a platter of add-ins. Mint, cilantro, jalepeno, lime, and bean sprouts are usually on the platter, although at this particular restaurant the cilantro had been simmered in with the broth. I don't know much about explaining the sauces, but there's a thick brown and a hot red, and soy sauce. The soup is eaten with chopsticks and an Asian spoon (see photo). Summer rolls are wrapped in thin rice paper, and include shrimp and pork, vermicelli, and some salad ingredients. They're served with a thick peanut sauce, although I like them with soy sauce. Personally, I'd like to try a different pho place, as I prefer to add the cilantro myself (I like a lot), but I'd still recommend this place. If you're into "bubble tea" (sometimes called "pearl smoothies"), they have a nice selection. Since I can't stand tapioca, I'm not a fan, but I've had several friends who quite enjoy them.